Mimsy: Welcome to Comic-Con 2012! 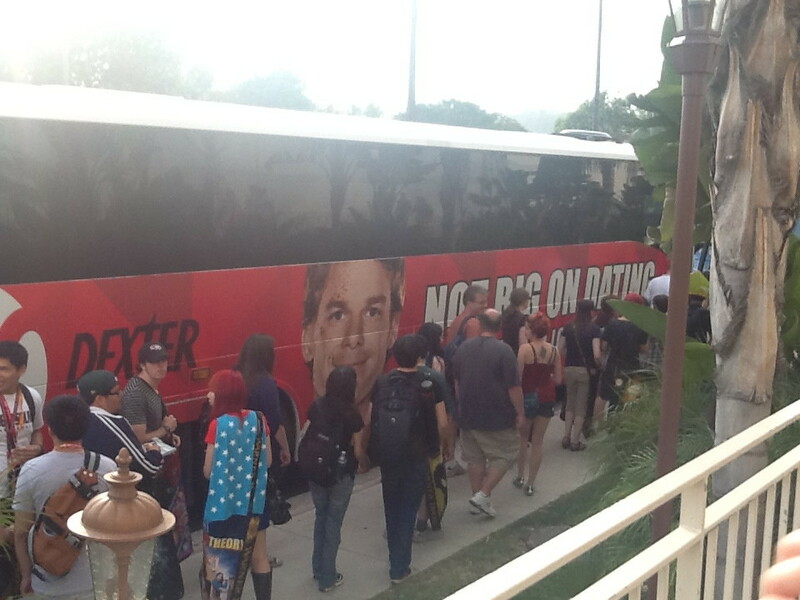 I’m not sure I’d stand in a line that ends in a Dexter-themed bus, especially not with what sounds like the theme from Soylent Green in the background. Everything changes, and Comic-Con is no exception. It’s Wednesday night and I’m down in Mission Valley at the Town & Country picking up my badge for 2012, rather than in The Field eating an Irish breakfast. But this year I don’t have a preview night badge and last year they stopped serving the breakfast during the con. I’m looking forward to picking up the latest Astro City TPB (yes, I’m a little behind), the latest League: Century book, whatever else I don’t even know about because I’m completely out of the loop, and just catching up with old friends. I started going to the con in 1989 when I was living a year in Los Angeles for tax reasons. Been there every year since and have half a bookshelf of Souvenir books with amazing art by people like Donna Barr, Roberta Gregory, Scott Shaw!, Charles Vess, Will Eisner, Rick Geary, Bob Burden, and on and on. I expect to have fun this time, too, although I probably won’t be staying out as late. Have a good time, and don’t forget about San Diego After Midnight if you need late-night eats. Not a whole lot in the way of 24-hour dining directly downtown, but if you head over to the Night and Day Cafe in Coronado1 you can combine the beach with good counter food. And up in Hillcrest or Kearny Mesa if you’re adventurous there`s quite a bit of real food open to two or three in the morning. I don’t have much in the way of photos from the early years—I couldn’t afford a camera. This, I think, is from 2003, looking out over the exhibition floor from the midway eating area. I was feeling a little bit of it today as I biked into work on the opening day of the San Diego Comic-Con. The shuttle signs are up, the traffic’s building, and I’m going to work. I even had tickets, but decided a few months ago to sell them back, both to get a little extra money and because it’s become progressively less enjoyable. In other words, it’s not as fun as it used to be. I think one of the catalysts was going to ComicFest last year. My first comic-con was 1989; I was living in Hollywood going to guitar school, and had friends in San Diego. I’d visit them occasionally because it was easier to get to the beach by going to San Diego than it was to navigate traffic west to Los Angeles’s beaches. 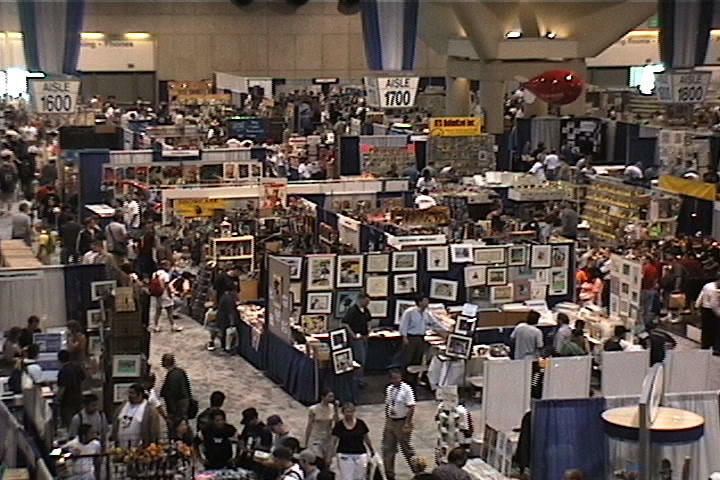 One summer weekend visit, I mentioned to one of my friends that there was this really big comic book convention in San Diego—he should find out when it is, and we should go. This was before the Internet was big enough that you could just go online and find everything. You had to search it out. So I didn’t find out until I was back in Los Angeles on Monday, when I got a phone call from him that the convention was the very next weekend, do you want to go? This was one of the summers of Ninja Turtle Mania, and the Turtles themselves were showing up; one of my apartment-mates in Los Angeles was a huge fan, so we had to go. Walked up to the doors at the San Diego Concourse Convention and Performing Arts Center, bought our tickets, and went in. There were, according to Wikipedia, 11,000 people that year. Within a couple of years I was meeting three groups of people: Usenet junkies, academics, and indie folks (due partly to having been to the much tinier Small Press Expo in Bethesda, Maryland, in 1995 or so). I heard about the Comic Arts Conference in its second year, 1993, when it was still off-site at the Horton Grand. I’m definitely going to miss the Comic Arts Conference. Even as Comic-Con became a sea of insanity, CAC remained an island of calm. Anaheim boasts 815,000 square feet for exhibits compared to San Diego’s 526,000. Two days into the con, probably the number one improvement they could make is to increase the space available around the booths for walking. The con fills San Diego’s convention center to the utmost, and it’s the exhibit hall where that is most obvious. Walking in the exhibit hall is like driving in an LA rush hour. One thing I can’t find is the number of people who would be allowed to attend if the con were at Anaheim. Las Vegas Convention Center is even bigger, but it’s in Vegas. I expect the SDCC board would like to keep the con in a mild-climate beach city near where they live. Anaheim’s convention center isn’t on the ocean like San Diego’s but it does get the climate and is a short drive. Here’s hoping DeMaio gets the chance to work out a good compromise for expansion. We live in an amazing world. When the Internet first arrived to our workplace, I would take notes during the con and then stay up late rewriting them into con reports. Sometimes I would try bringing a laptop, but they were heavy, I had to carefully track battery time1, and I still had to post them after getting home. Today we have ubiquitous Internet and a portable computer device—the iPad—that not only lets me write on the fly, but post on the fly and include photos. It’s a wonderful life, so please don’t sic Uncle Creepy or cousin Eerie on me for suggesting that an iPad with Skype3 might make a wonderful conference tool. July 12, 2012: Suicide Squad complete run! I just told the dealer I’m not looking for any Action. I’m not sure he heard the capitalization. But I did manage to finally complete my collection of Ostrander’s Suicide Squad. It was a fun series and it’ll be nice to have the complete story. Got the last issue of Sandman I needed, too. Most of the early ones I have via trade paperbacks, but I’ve been hoping to avoid picking up the TPB that includes issue 59 just to get that one issue. Finally found it 4 for $10. I don’t think I’ll ever complete my 120-era X-Men, they’re still too expensive. And holy crap I hope the Neil Gaiman Miracle Man run becomes available as a TPB. They’re running even higher than X-Men (as they should). Well, thank you Amazon, it appears there used to be one, and it’s running in the hundreds of dollars, too. As an aside, they should get MTV to do WiFi next year as well. It has been 100% reliable for me so far. Also completed the Ann Nocenti/Don Perlin Beauty and the Beast four-issue limited series from 1985. Not exactly a collector’s item but they were both fave characters for me back in the day and I have been missing the final fourth issue. Now the story can be told! Outside of 26AB, the Comics Art Conference room, the Whedonverse fans were forming a line. There’s never a line for CAC. They were just forming one out of habit. I walked right in1 and they followed. 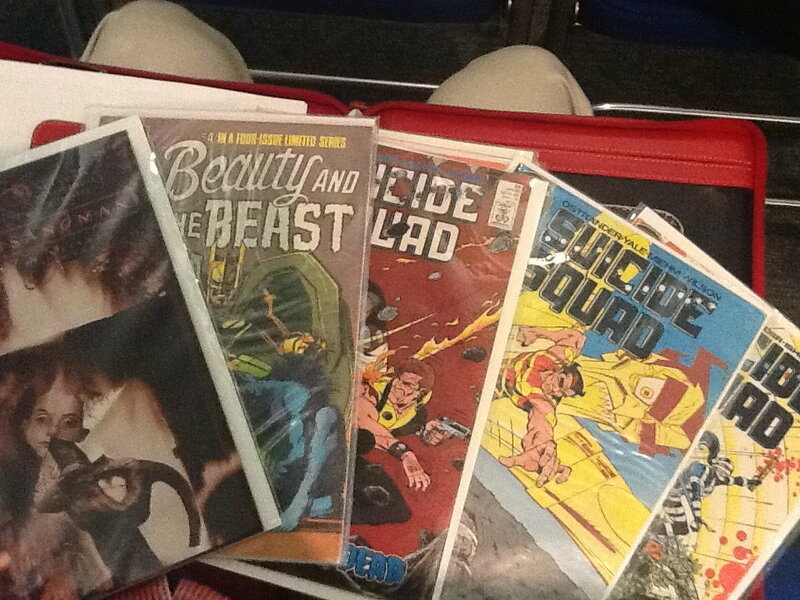 I got a taste of what they are used to waiting to get in on the Edgar Rice Burroughs panel of all things. Good to see that Mark Evanier is still such a draw. While waiting in line the con rep started making up new rules, asking everyone not in line for Tarzan to step to the back of the line. I’m pretty sure some people waiting for John Carter stepped back, and I’m hoping they were Disney executives. 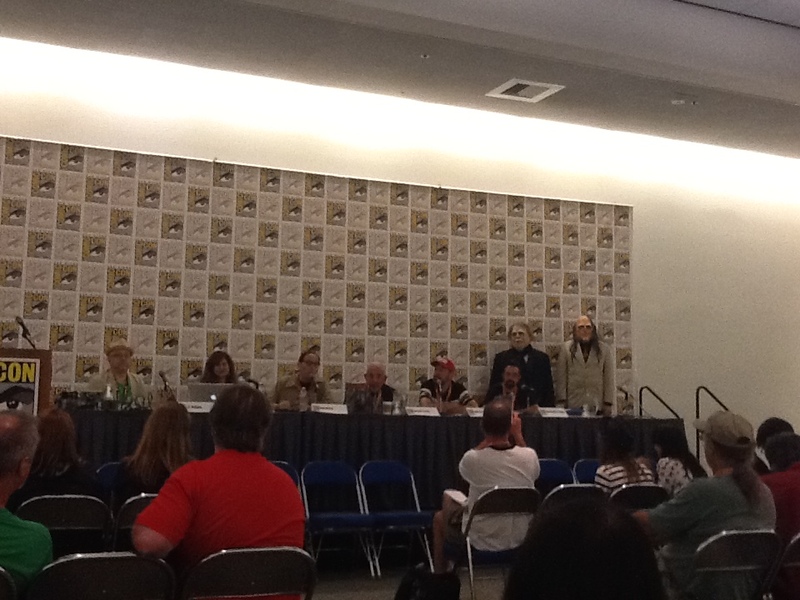 Since the next panel also features Mark Evanier, I’m guessing no one intelligent said they weren’t in line for Tarzan. I actually had to wait in two lines for ERB. 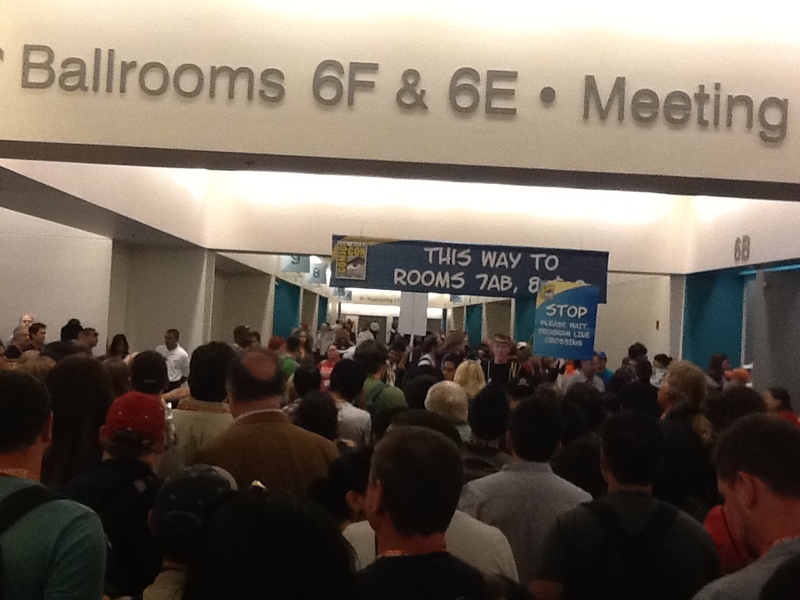 The photo shows us waiting in line to get past the line for room 6AB. That line went out the hallway, probably fifteen or so people wide. Ahead and to my left I saw Mark continually wiping his brow as the 6AB line went on for a minute, two minutes, and well after Mark’s panel started. Lines cross at Comic-Con. Look to the left to see Mark Evanier sweating because he’s late for a panel. Watch out for construction, Harbor Drive is closed between Beardsley and 28th but you can go north a block to Main Street once you hit it. Interestingly, they’re a morning cafe for most of the week, but starting Wednesday night at 10 PM they become a 24-hour cafe until Sunday. Missing the greatest comic convention of the year? This post may sound like sour grapes, but not likely. Nostalgia isn’t as good as it used to be. San Diego Comic Fest 2012! Off to Comic Fest 2012. Should be interesting if nothing else! Rationing is almost never the choice, unless you want to create a subculture that thrives on dealing with the rationing scheme. Rationing is trying to force the same amount of water through a smaller and smaller pipe. It’s going to start leaking and finding ways around the pipe. Fewer comics then ever, but the old folks still keep showing up. Arthur’s pal Jerry Stratton visits the San Diego Comic-Con. Welcome to Comic-Con 2012! last modified September 8th, 2013.